Touhou Luna Nights, a Metrovania currently in development by Team Ladybug and available via Steam Early Access, will be receiving it’s last update before finally leaving Early Access February 26th. Touhou Luna Nights stars Sakuya Izayoi of the Touhou Project series, and focuses around her ability to control time and to dispatch her enemies with her impressive knife throwing skills. Also being brought over from Touhou Project games is it’s “grazing” system, rewarding the player for adapting a more risky playstyle. 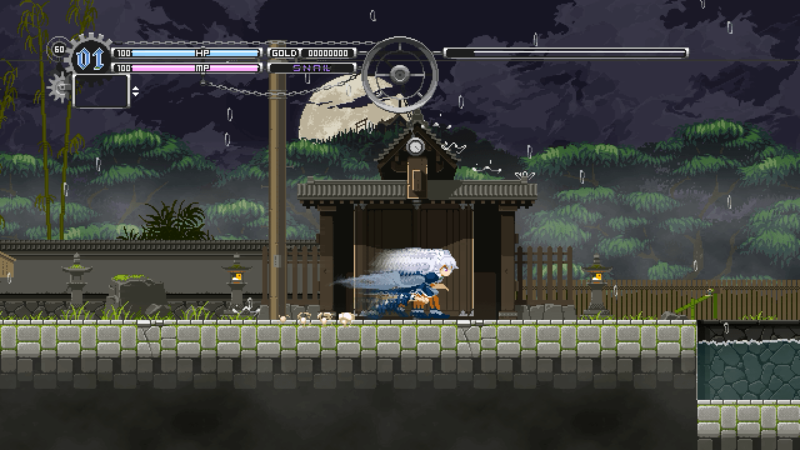 This update is adding Stages 4 and 5 into the game as well as new features to enhance Sakuya’s abilities and gameplay. As previously mentioned, it will also mark the end of the games time in early access which will bring about a price change from $11.99 USD to $17.99, so if you’re hyped for some Touhou Metrovania action now might be a good time to pick it up. Finally, PLAYISM is also announcing an art contest going on right now until March 12th over at their Twitter. The art must be of the games protagonist, Sakuya Izayoi, and the winning piece will be featured as official banner art for a limited time. To participate just follow PLAYISM on either @playismEN or @playismJP and Tweet them your artwork with the hashtag “#TLN_FAC”.